Alas, we come to the final full-length book in the “Brothers Sinister” series. The book’s original title was The Mistress Rebellion, and, according to the author note, it was going to have a completely different kind of male lead. I think everyone will agree that the author made excellent decisions with both the title change and the hero’s personality. THE PLOT: Frederica “Free” Marshall is a suffragette in 1877 England. She runs a newspaper “written by women, for women, about women.” Edward Clark is a man with a tragic past. He’s been pretending to be dead for years after a family betrayal. Now he’s come back to England to stop his own younger brother, James, from persecuting Edward’s childhood friend, Stephen Shaugnessy. Only he finds out that James isn’t really after Stephen; he’s trying to bring down Stephen’s employer…Free. Edward is really the rightful Viscount Claridge, but he has promised James that he’ll “stay dead” and let James be the viscount if he just stops the attacks on Stephen (and Free). But of course James won’t stop. In the meantime, Free is drawn to this man who is a self-proclaimed untrustworthy forger, but may be a whole lot more besides. How does Free stay safe without giving up her newspaper? How does Edward avoid claiming his rightful inheritance and becoming a peer? Will he ever confess to Free that he’s lied to her about his identity? How do they both stay the people they are without compromising for love? MY TWO CENTS: I know this will come as a shock to my readers (sarcasm), but I loved this one. I may even have loved it a little more than The Heiress Effect (reviewed here), but I’m not sure. That’s a LOT of love. Free is a fantastic character. She’s absolutely intelligent and firm in her beliefs throughout the book. She’s strong but not abrasive. 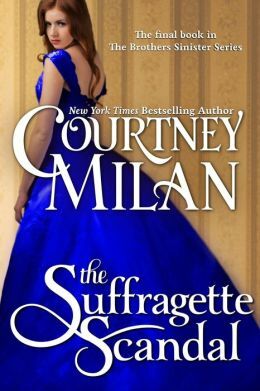 It would have been easy to make an abrasive suffragette, but Milan deftly makes Free lovably assertive, not annoyingly aggressive. Edward is also a great character, and Free’s perfect match. Their first few scenes together are almost like a screwball comedy of one-upmanship (hint: Edward never wins). But the real key is that, by the end of the book, they know each other well enough to truly complete the other. It’s like magic. I also have to mention yet another three-dimensional villain in James. He’s not your normal mustache-twirling “Mwha ha ha” villain. He’s really a weakling who convinces himself that he’s completely justified in all his actions, no matter how loathsome they are. Luckily, Edward has his number and knows just how to play him. BOTTOM LINE: Another stellar offering from Courtney Milan, quite possibly the best in the whole series. How lucky for us readers that Free “demanded” her own book! And we still have Stephen Shaughnessy’s novella, Talk Sweetly to Me, to complete the series in August. My only fear is that her next series, the “Worth Saga,” won’t be as good…but maybe it will be even better. ON SALE DATE: E-book formats are on sale now; audio will be released soon. I don’t see a print version listed on Amazon, but print versions are usually available at some point.